A few nights ago I realized my favorite part of open adoption. It is sharing my proudest moments with someone else that is equally proud! I just LOVE when my son does something new and I can share it with his birth mom. Sure I can say it to my family or post it on Facebook. It may even get a bunch of likes and comments. But other than his birth parents, no one is quite the same level of proud of him as we are. That is a very special bond. My husband has been away on business for a few weeks. He has luckily been given the ability to come home for the weekend to spend time with us (and because he teaches a Saturday class at a local college). This weekend we tried basking in as much family time as possible. Friday after we picked up Isaac from school, we went out to dinner and since the weather was perfect, we headed to the outlet mall to get the boys some new gym shoes. When we returned home, the boys still wanted to be outside (Ezra loves being outside and is constantly running to the door saying “side”). Joe and Isaac were tossing the football around and Ezra was just cruising around the driveway and the yard in his new Nike’s. Of course, like any proud mom with an iPhone, I was snapping pictures. Then I remembered that T, his birth mom, had asked if he was starting to run yet. So when he was chasing the dog, dad and brother around the yard, I switched the camera to video mode and recorded a little one minute clip of him running around and “playing” football. I couldn’t wait to send it to her! Her response was pure joy! “Look at him run. I love it. It almost looks like he’s been running and walking for years!” I typed back “he’s a pro!” and her next message was when it hit me… she said “I’m so proud.” It is those moments that I know that no matter how many likes a picture gets on Facebook or how many oohs and ahhs grandparents, friends or other family members give, no one else in the world shares the same love for him with me and Joe as his birth parents do. They’ll never tire of seeing pictures that look exactly the same as the ones I took the day before. They’ll never think I talk too much about him. They’ll never think “Gosh this woman is obsessed with her baby.”. They get it. They are still his parents too, even if they aren’t parenting him. They are proud of him. They love him. They take joy in his happiness. So many people are still scared off by open adoption, simply because they don’t understand it. Open adoption is not co-parenting or fearing that my status as “Mom” is at risk. It is sharing the joy of a child that is loved by many. Imagine depriving them that joy of knowing how he is doing, that would be a terrible heartache to be responsible for causing. Being able to share with him their love, well that in itself is very special. 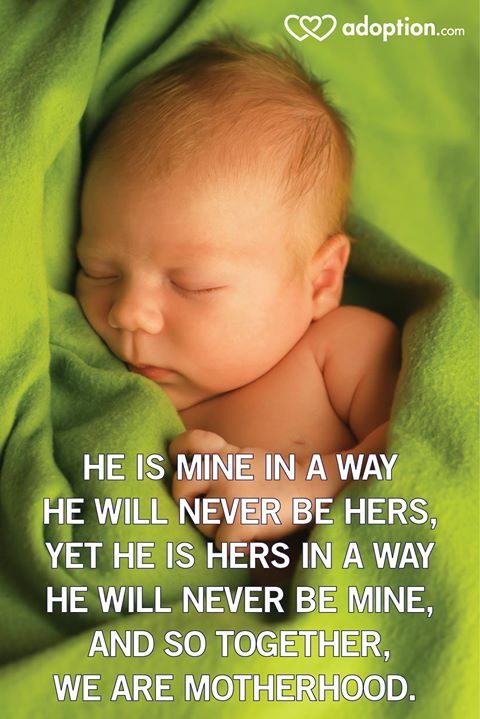 He will know he is precious, loved and cherished. It seems time has gotten away from me and it’s been awhile since my last post. The life of having a one year old is not what I remember when Isaac was this age. Granted I didn’t have a career back then. I didn’t serve on the PTA as a chairperson. I didn’t write a blog. I don’t even remember having this many chores; laundry is never ending, the dish washer is full every day, there are toys that scatter my house, not to mention all this SNOW! I just pretty much sat around playing with my baby. The best part of having a one year old again, is watching him grow. One of the biggest reasons we chose domestic infant adoption was, although I had a biological child, Joe became a step dad when Isaac was 6 years old. He was not there for the milestones that come with a baby. I wanted him to experience the joys of being called dad and understanding the kind of love you get when you bring a baby home from the hospital and are present for every first. 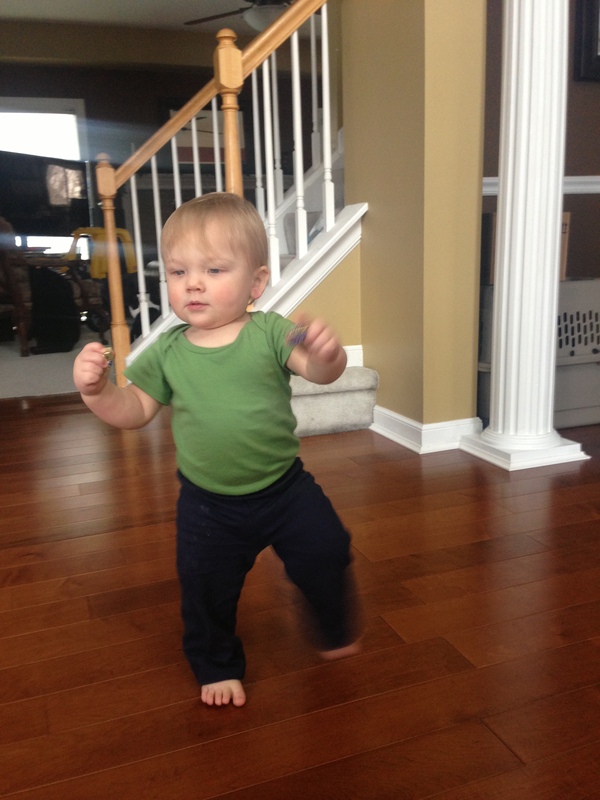 Ezra just started walking. That was a milestone I was so excited for, yet so sad when it happened! My little baby, likely our last child, was growing up. It’s like the ultimate transitional milestone from being a baby to a toddler/kid. I was so excited when he lifted his head the first time, or smiled the first time, that first laugh, first bite of cereal, first roll, first crawl, first word, first stand… but first WALK!?! Experiencing milestones gives me so much joy. It’s when I see him the most as MY son. My beaming pride, the look of adoration on my husband’s face, the clapping and cheering that comes from my older son, Isaac; it is all part of parenting and being a family. When a couple faces infertility or enters the realm of adoption, milestones may be something they fear they will never get to experience. I guarantee no matter if you adopt an infant or through foster care, there will be a lifetime of firsts that bring smiles and tears.